These molasses cookies a kind of amazing little things. Maybe it is just my new found love of molasses, maybe because the dough is great by itself, there could be many reasons. When I asked my great grandpa what kind of cookies he wanted me to make, he said, 'Can you make molasses? Everyone always makes me chocolate chip but I want molasses' So that was my goal. I made a whole bunch and froze then in individual bags so he could have them for a while. This recipe is based on one from Cook's Illustrated. When baking them, don't bake until they look done. Bake them until the edges are done but the center still looks doughy. When they cool, they will harden up but still keep that nice chewy texture. One of the best cookie recipes I have ever made. One of the first places we stopped, The Franklin Cider Mill. They had lots of fruit, vegetables, honey, jams and tons of apple products. Including donuts that are a tradition for us to get. So many apples. We had bags full of apples with us for the whole trip. We could go through them fast enough. The kitchen of my great aunt's house. His front yard. The stairs lead straight down to the beach, Lake Huron. My great great great great grandmother's grave. The weather was cold and brisk but I still rode the bike around for a bit. I learned to ride a bike in Michigan when I was little and probably have rode one only a few times since then. I would not call myself coordinated. We took a trip to the Eastern Market in Detroit before making a side trip to Canada. The market was abundant and their were lots of people, which was surprising based on the conditions of the city. When driving through Detroit, my dad said 'It looks like a war has gone on and no one's won.' Sad but true. Looking around Detroit, you could practically cry, the city is nearly in ruins. I don't remember what these things are called, but I remember I first saw them on Athena Plichta's blog. Her photos of them were magical, as are all her photos. It's like the one blog that I have in my bookmarks bar that I check daily. I swear I'm not a stalker, her photos just inspire me that much. So it made me so happy so see those pumpkin tree things that she had. Sunflower heads. I have never seen people selling the dried heads before. I wish I would have been closer to home so I could have bought a bunch. The final photos of the Michigan trip on the next post. Lovely photos. I especially like the bed, and the pumpkin-tree-thing. And! Good to know about the cookies. I'm always scared to try molasses cookies - they always turn out hard and gross. I will have to try these - they look amazing. Such beautiful photos! Love molasses cookies too. Actually, love molasses anything, now that I think about it. 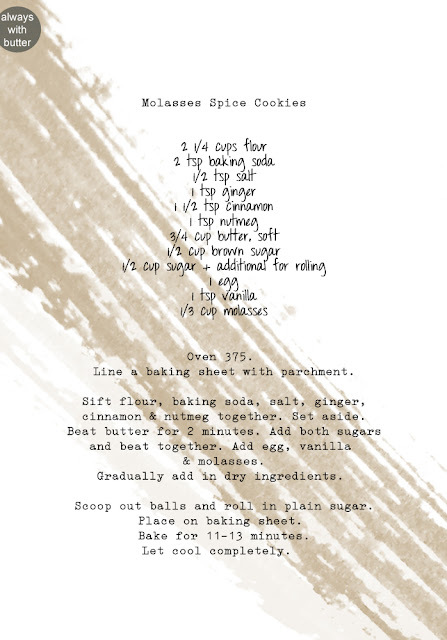 And these molasses cookies sound amazing!! The pictures are amazing! I can have a dozen of these cookies together. Also, I've never tried Molasses cookies before. I'll have to give them a whirl one of these days! Oh, love everything about this post. The light is wonderful in the photos of the cookies, and even in your great grandpa's room. Thanks so much for the mention, I'm as big of a fan of your work, maybe more! Def. gotta have a photo shoot together someday. Your great grand Pa looks like a lovely person! You're lucky to still have him around, and he's lucky to have you too!!! Happy holidays and thanks fit sharing your family with us. Cookies look delicious (as always), and I love the sign for that bridge! Ha :) Super cute. Beautiful pictures! The cookies look amazing! Your pictures are so beautiful. You have captured everyday real life. Wonderful and pure. I love Michingan and Eastern Market. My husband's family is from Michigan ... we have family in Davisburg, Royal Oak, and Levona. We were just back there last month and I loved sitting by the water's edge and admiring all of the changing of the leaves. Bisous. Lovely post. The shots of Michigan and family are just as wonderful as those delicious molasses cookies. Btw, I'd gladly take a few to go with my steeping tea. Your photos are really, really beautiful. I've not been to Michigan since I was a kid (though I grew up in Pennsylvania and go back every year) and this post makes me want to visit. Does anyone know where you can buy molasses in Melbourne, Australia? I would like to try these cookies but I have never seen molasses for sale here. Absolutely loved all the Michigan pictures! i made these cookies the other day and they are the best cookies i have ever made! they have a lovely taste and texture and my family loves them. In from Melbourne, australia and i just brought the molasses from Woolworth's in my hometown it was where the jams and spreads are kept. thankyou for a fantastic recipe! Wonderful recipke! We've started creating my personal washing cleaning agent just recently : as well as love it * along with use a pretreatment spray * These are Simple elements and I'm planning to offer vid test!!! Thank you for submitting the idea!